You will often hear people say that artists, in particular the Impressionists and post-Impressionists like van Gogh and Gauguin, found the quality of the light particularly appealing in Provence, that area in the south of France that was the first province established by the Romans outside of Italy. I have to say that I was skeptical of this until I visited the region around Arles a few years ago and experienced it for myself. There really is something extraordinary about the light there and the effect it has on the appearance of color in the area’s beautiful landscape, and I can easily understand why artists find the region particularly appealing. Julian Merrow-Smith is an English painter in Provence. (Sounds like it should be a Sting song, doesn’t it?) He paints in a direct, Impressionist influenced style that is spare on details and rich in color and light. His deceptively simple compositions are wonderful expressions of how much can be suggested with a minimum of brush strokes. (The image above is actually one of his more elaborate paintings, I just happen to really like it.) He pulls short of flattening his compositions into planes like Cezanne, who is obviously an influence, and leaves enough suggestion of detail to keep them vibrantly three-dimensional; creating in his landscapes scenes that are at once inviting to walk into and yet obviously paint on a surface. He paints the countryside in and around his adopted home of Crillon le Brave, a small village in the hill country in the south of France, with an eye to the extraordinary in the ordinary. 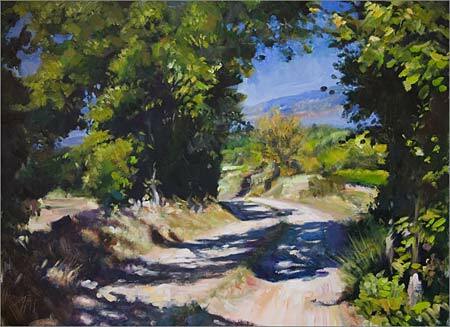 He has recurring theme that I particularly enjoy of compositions that find rich contrasts in the shadows of trees laying across roads or paths in the warm light of the Provence sun. Merrow-Smith also paints still life and portraits, but as much as I like his other work, particularly his small scale still lifes, it is the Provence landscapes that I enjoy the most. His portraits have a rough-hewn appearance, as if the paint were applied like a sculptor adding clay with his thumb. His still lifes range from very simple compositions of a few objects to the more formal large scale paintings that were commissioned by Cunard to hang in the Britannia Restaurant aboard the Queen Mary 2. In a practice that goes back almost as far as, and I think is independent of, Duane Keiser’s “Painting a Day” project, Merrow-Smith has been posting his small postcard-sized paintings on his “Postcard from Provence” blog. Although not strictly daily, he has kept pretty close to that, and, more importantly, kept a high-level of quality and consistency. Like Keiser and the growing number of “painting a day” adherents who are following in their footsteps, Merrow-Smith puts his small paintings up for sale on the blog as he creates them. Unlike Keiser, (and much to my amazement) he has not allowed demand to raise his price much and still offers his small works at $120. He sends out notice of new paintings to a mailing list of subscribers where they are, not surprisingly, snapped up within minutes of being posted. He also sometimes photographs the works and makes them available as limited edition prints. The paintings on the Postcard from Provence site can be viewed by category, so you can contemplate his serene still lifes and intimate flower studies, relax by the Mediterranean or talk a walk through the sunlit fields of Provence. Thanks Charley for a very generous write up. I’d like to just say that whilst I had a mailing list and sold mostly via the internet and even painted small postcard sized paintings on card, Duane Keiser was the person who showed me what could be done and how large an audience could be found via the blog format – I had my blog running within about 6 weeks of Duane starting his painting a day, we even swapped paintings. Thanks for the comment and info about the inspiration from Duane Keiser. I still think you were one of the earliest to explore this avenue after him. Thanks for the comment about Eric Tiemens. I did a post on Tiemens last year, and I like his work a lot, but I didn’t make the stylistic connection until you mentioned it. Same for art as XTC’s album title “Drums and Wires” is for rock n’ roll. Julian is very definitely one of my favourite “painting a day” painters. I’ve got Duane and Julian tagged as “the original and the best” on my blog http:/makingamark.blogspot.com . There are many who try to follow Julian and Duane in the internet daily painting ‘movement’ but very few who get near to achieving what those two have done. Initially – in literally posting a new painting every day – but also in managing to create small paintings that I wanted to own every morning when they dropped into my inbox. And yes, the light in Provence really is very special! I’d like to argue with Katherine Tyrrell about “few who get near to achieving what those two have done.” If you really study what is out there these days with internet daily painting, there are some other quite stunning examples. Three other daily painters who I particularly enjoy are Karin Jurick, Carol Marine, and Mick McGinty. All three are doing paintings which are as consistent and winning as Keiser and Merrow-Smith. It is not only about who was first. Each artist has something quite unique to offer about their daily work, and anyone is to be applauded for allowing their daily discipline of painting to go public and be shared, irregardless of sales. Thanks for your comments. I can’t speak for Katherine, but I think she is, at least in part, referring to the fact they are the earliest pioneers in this territory, and have been carrying on the practice for the longest time, in addition to being superb painters. I agree with you about the wonderful paintings of Karin Jurick, Carole Marine and Mick McGinty, as you can see in my posts about them. Other readers may want to take a look at Mona Conner’s intricately detailed and brightly colored paintings. Mona works in egg tempera, gouache and watercolor. I’ve been a follower of Duane for over a year. Just got introduced to Julian a couple of days ago. Both are terrific talents a pioneers. They both give me something to aspire to in my own painting. I must say I love the paiting ‘A Road in Provence’. I chose it as a project in school. For that reason I have to find out some information that I can not find anywhere else on the internet or books.. So I was wondering if you could answer some questions for me: What’s the meaning of the painting? What was it that made you, gave you the idea or inspired you to paint it? By painting it, How do you express yourself and what do you want others to know about it? I will be forever grateful to have this information as soon as possible. Julian will not necessarily see your comment posted here. You should go to the Contact page on his own site. Ok.Thank you for the information.